Hi everyone, it's Tracey back to share a special Thanksgiving card with you today. As you probably have figured out, my go to adhesives these days are the Helmar liquid adhesives that work so well with my mixed media style. However, when putting a card together, the Helmar Quickfix Adhesive Runner works great to make quick work of putting all the paper layers together. I prepared my layers by trimming to size, inking the edges and stitching. Then to adhere, I simply ran the Helmar Quickfix Adhesive Runner around the edges. There are two things I appreciate about the Helmar Quickfix Adhesive Runner. First, it is very tacky, so I don't have to worry about my project coming apart. Second, it is just adhesive - no stiff tape component, so it's easy to apply to curvy shapes as well as straight lines. I also used the Helmar Quickfix Adhesive Runner to adhere my strip of ribbon. I selected flowers, a berry sprig and jewelry pendant from my stash. These heavier items were adhered with Helmar 450 Quick Dry Adhesive. I stamped and heat embossed my sentiment on white cardstock, then centered and die cut it before rubbing with several shades of ink to color. I also stamped and embossed the inside sentiment. 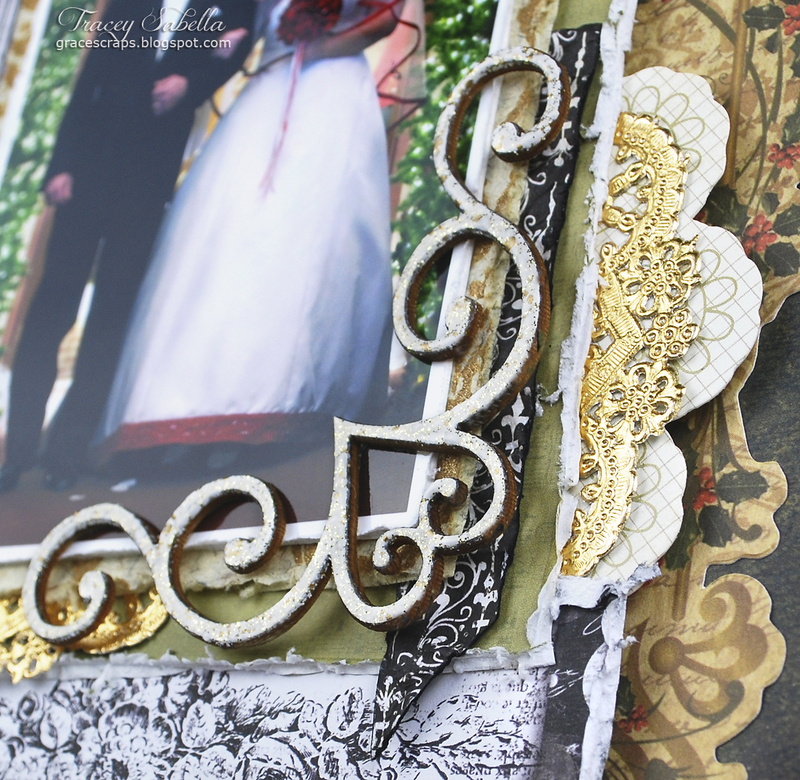 Here is where I really love using the adhesive runner - to build layered frames. I cut out my sentiment, then applied the adhesive runner to adhere to the darker cardstock and used a transparent ruler and craft knife to trim the mat for perfectly even edges. 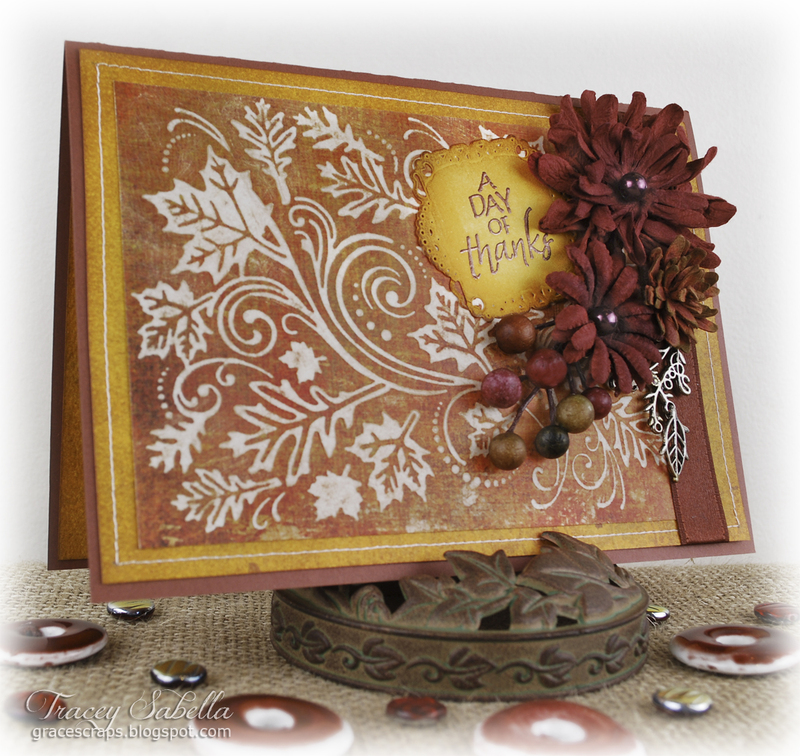 Before adhering my layers, I created this design on the top layer by dry embossing the grungy fall color paper. I then sanded the raised edges to expose the white paper core. Thanks for dropping by today to check out my project. I hope you've been inspired to create!! Christine joining you today with some pieces I created for my Thanksgiving table. I love burlap and absolutely love to use it on my paper crafting projects, but if we are being honest, it is not the easiest stuff to work with! For today's project I was looking for a way to stiffen up my burlap and keep it from fraying so much. Helmar's Fabric Stiffener and Draping Liquid was perfect for that and allowed me to put together this place setting which includes a burlap napkin ring! This is a pretty messy project so I suggest setting up on a countertop or somewhere where it will have time to dry and not get in the way of your other supplies. I laid my burlap out on wax paper and poured some of the fabric stiffener into a bowl. I then used a paint brush to apply a thick layer of the fabric stiffener to the body part of the burlap but avoided the fringe. When you are done it should look nice and thick like this! I allowed mine to dry overnight. Then it rolled up nice and easily into a napkin ring. It made the fringe much less likely to unravel....it's still not foolproof but doesn't fall apart nearly as easy as it did without! 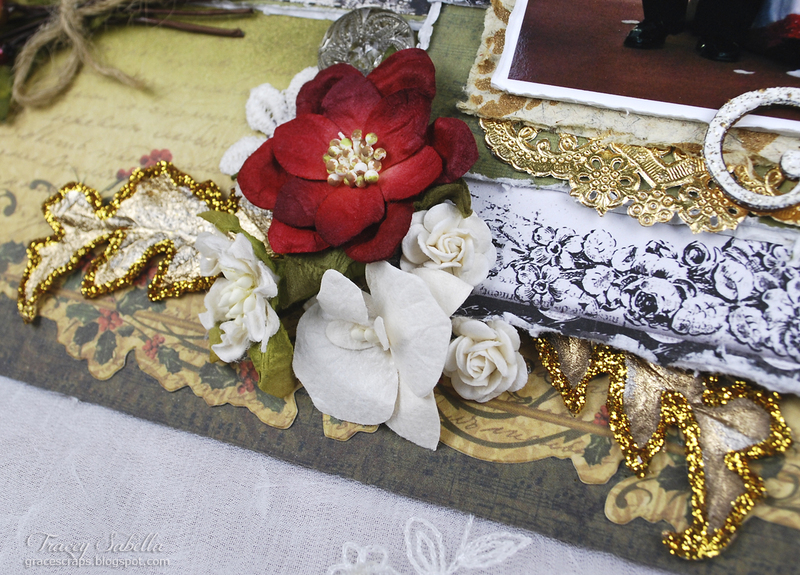 Here it is up close with the embellishments that I added using Zap Dots (these held great to the burlap). Hope you all have a wonderful Thanksgiving week! G'day Helmar Fans it's time for the challenge to return! 5. If there is no correct answer by the next Helmar Teaser this prize will carry over additional to the prize for the next Helmar Teaser. 6. Answers must be posted on this post on the Helmar Facebook page. 7. Design Team members current and past are ineligible to enter. I grew up on a farm surrounded by oranges. All you need are some small page pebbles or similar, stamped images to fit the pebbles using permanent ink, a flat backed chandelier crystal and an image of your choice. 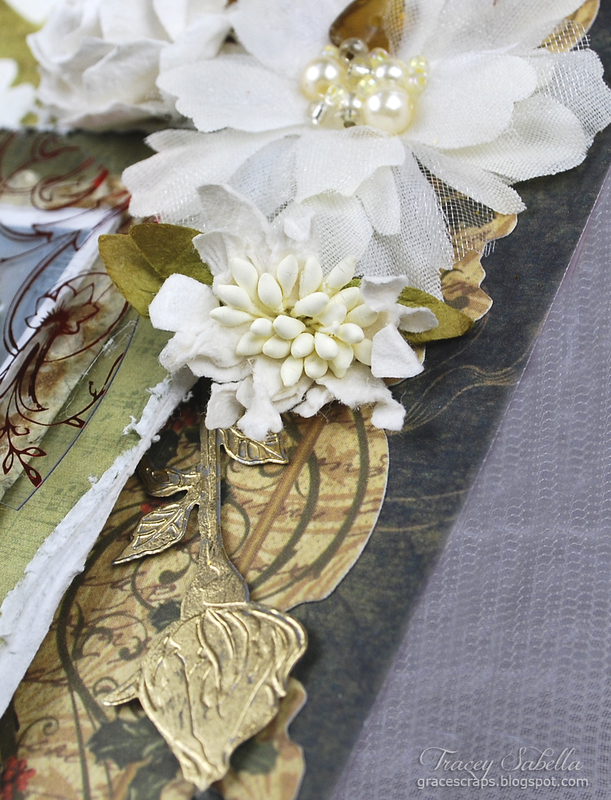 Some scraps of lace, paper and ribbon or seam binding and of course Helmar Premium Craft Glue. Cut the stamped images to fit the pebbles and the printed image to fit the crystal, the easiest way to do this if you don't have a punch is to trace around the pebble/crystal and then cut slightly inside this line and it should fit wonderfully. If you don't have permanent ink in your printer it is a good idea to spray your image gently with a little hairspray to help prevent running (allow this to dry). Once you have cut out your images then all you have to do is apply Helmar Premium Craft Glue to the underside of the pebble/crystal, smooth out with your finger and then gently place your image (right side against the glue). Allow about 10 minutes for the glue to dry (and it dries crystal clear!) 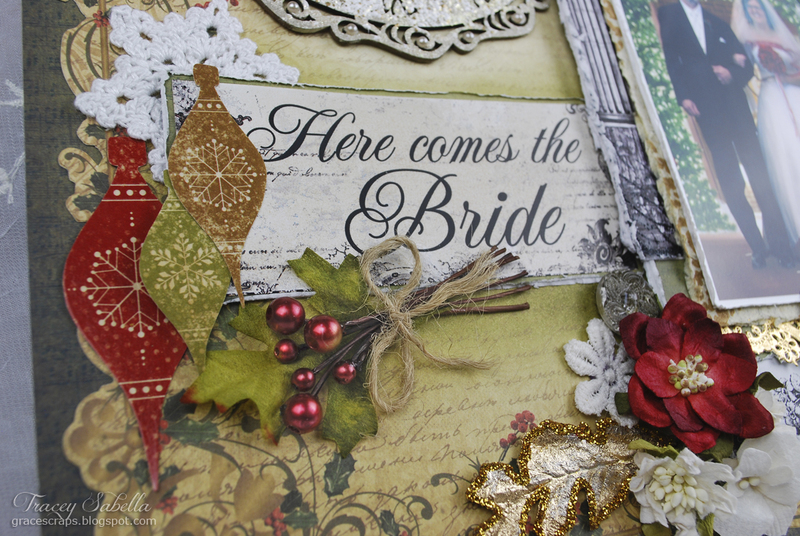 and then continue to use your new embellishments. I will be using these pebbles on some Christmas tags and the crystal will be hung on my Christmas tree. Do you have a particular gift giving tradition? I have been making a small hand made Christmas gift for my neighbor ladies that live in the same building as I do for the past several years. This year I am making them some monogrammed sachet bags. I am going to be using some Helmar Craft Glue along with the other products seen here to create my sachet bags. First, fold the bag in half and run a line of Helmar Craft Glue across the glassine bag and adhere some lace trim. Next, use a rub-on to decorate the front of your bag. You could use a sticker too. 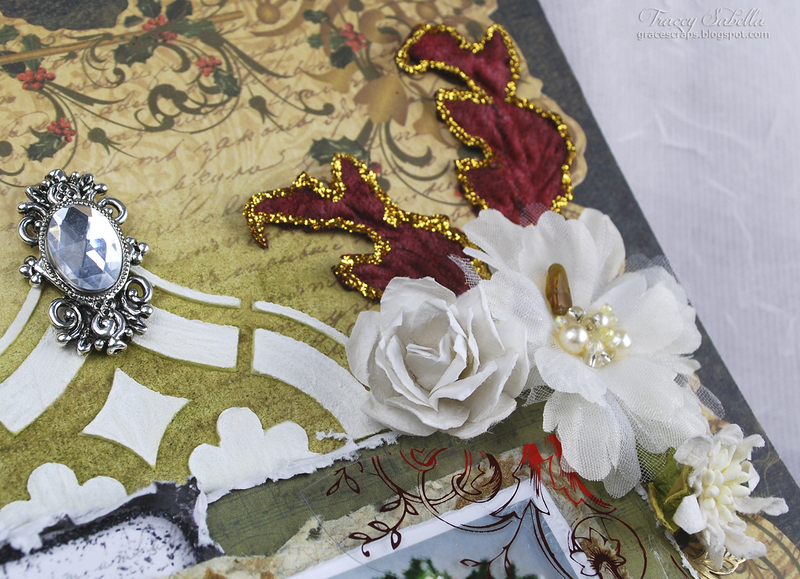 I used the Helmar Craft Glue to hold my charm onto the lace and then used thread to tack it down. I don't have to sew the charm onto the lace because the glue will secure it but I like the look of "I hand sewed this! " because it appears that I took more time to make it than I actually did! Then I add a line of Helmar Craft Glue right above the lace and lay my string of pearls over it. It really grabs hold of them and secures them easily! To finish it off, add a ¼ cup of scented crushed potpourri to your bag, fold it back over and glue the flap back down to seal it in. with Helmar Craft Glue at your side! It's Tracey here to share a layout I created of our lovely daughter-in-law with her father walking her down the isle to our son, Joseph on their wedding day. They were married in early December with the church decorated for Christmas. 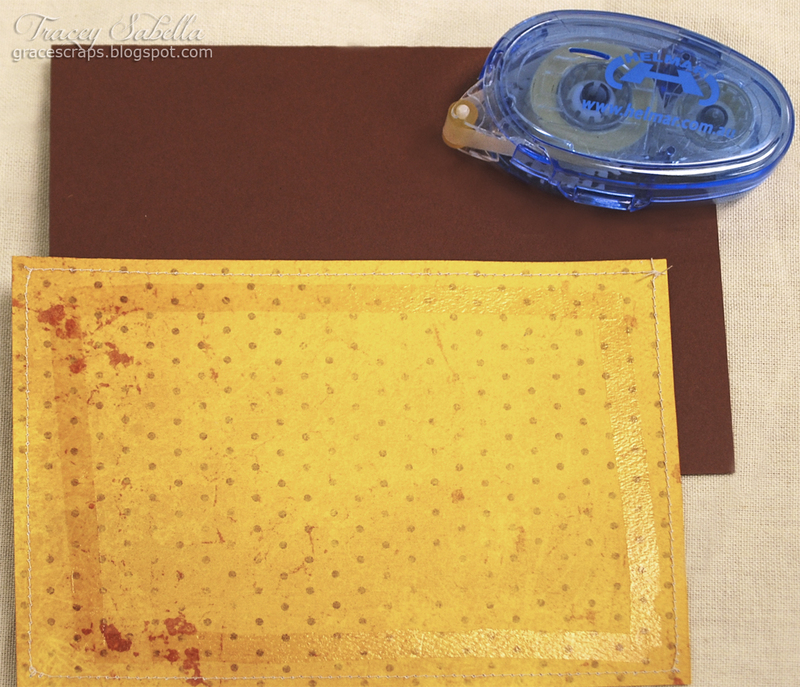 I share throughout my post how I've used Helmar's fabulous adhesives, but am featuring Helmar Zapdots for this page. I adore using mixed media and lots of layers. For that to work, I find that I need to raise certain elements on my pages, particularly the photo mat. You'll see why and how in my tips and techniques. When I layer on my pages, one of the things I like to do is to raise the photo and mats, so that I can tuck a variety of elements and flowers underneath. Helmar Zapdots are the perfect solution for this task! I simply glue the photo and mat layers together with Helmar Premium Craft Glue, then place three or four Zapdots down the back as shown. This will leave all the edges free. Once I'm done embellishing, if there are any areas that need more support, I add more Zapdots. 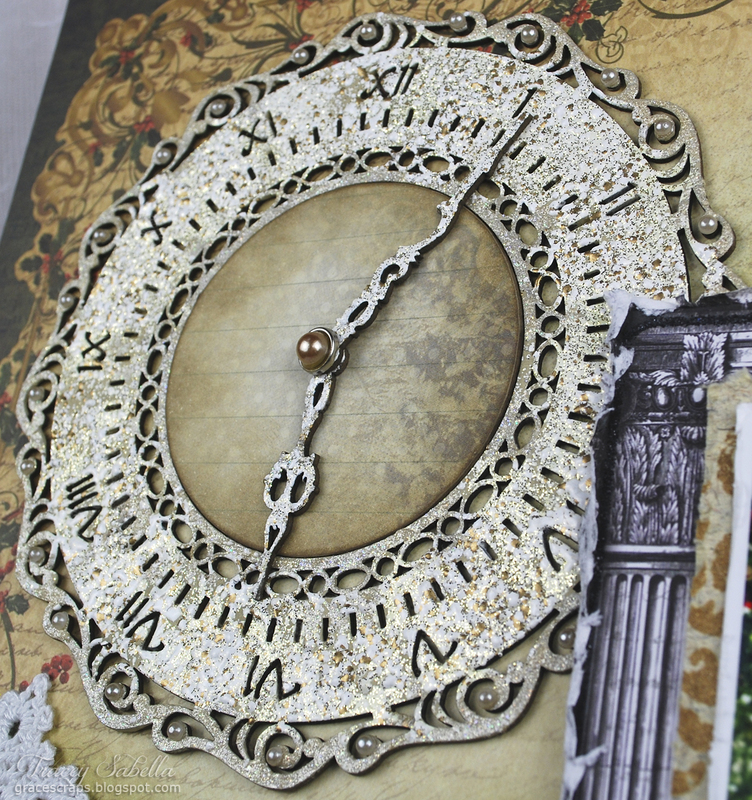 This chipboard clock was heat embossed and embellished with small pearls, then adhered with Helmar 450 Quick Dry Adhesive. These lovely flowers and the window charm are all adhered with Helmar 450 Quick Dry Adhesive - my favorite adhesive when adhering to a mixed media background like I have here. The transparency corner piece is also adhered with a small dab as well. The window shape was stenciled using molding paste. I inked the background paper first to help make this textured image pop. Here's another view of the same flowers. You can see that I also tucked in a gold metal rose. Helmar 450 Quick Dry Adhesive is a fabulous adhesive for a variety of materials including metal. You can also see how I tucked parts of this cluster in under the raised photo mats. This is why Helmar Zapdots work so well for this application! This wooden heart flourish was heat embossed with embossing powder. 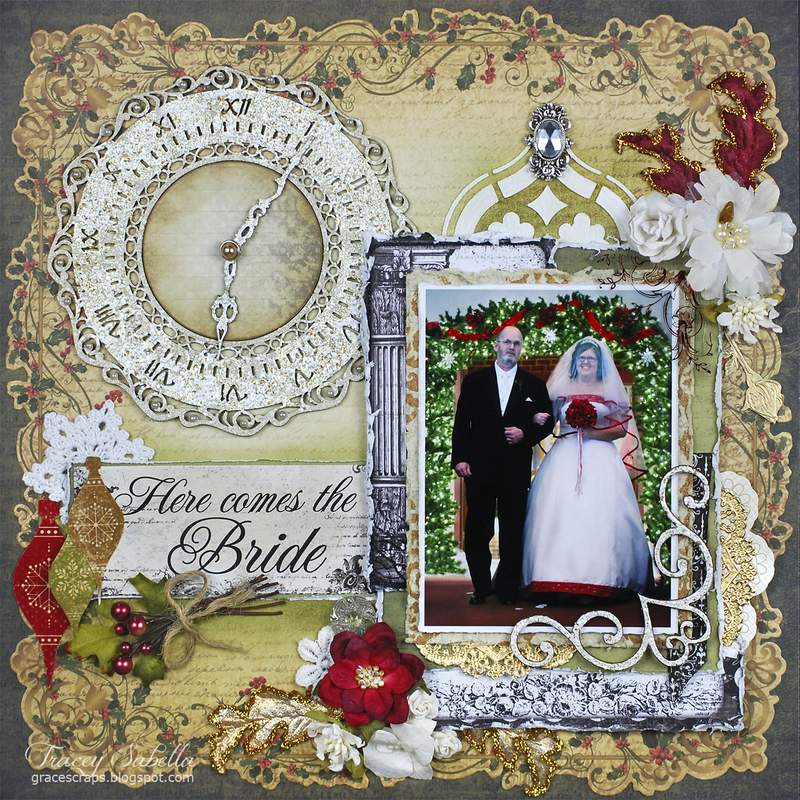 I used lots of layers, from distressed papers to shiny gold doilies - all adhered with Helmar Premium Craft Glue. Another of my flower clusters - again you can see how the Helmar Zapdots raised the photo mat so that some of my elements can easily be tucked right underneath. A close-up of these lovely flowers. Finally, my embellished title. I inked around the background area where I planed to place my title sticker. The paper ornaments were fussy cut from coordinating paper and adhered with Helmar Premium Craft Glue, while the berry cluster is adhered with Helmar 450 Quick Dry Adhesive. 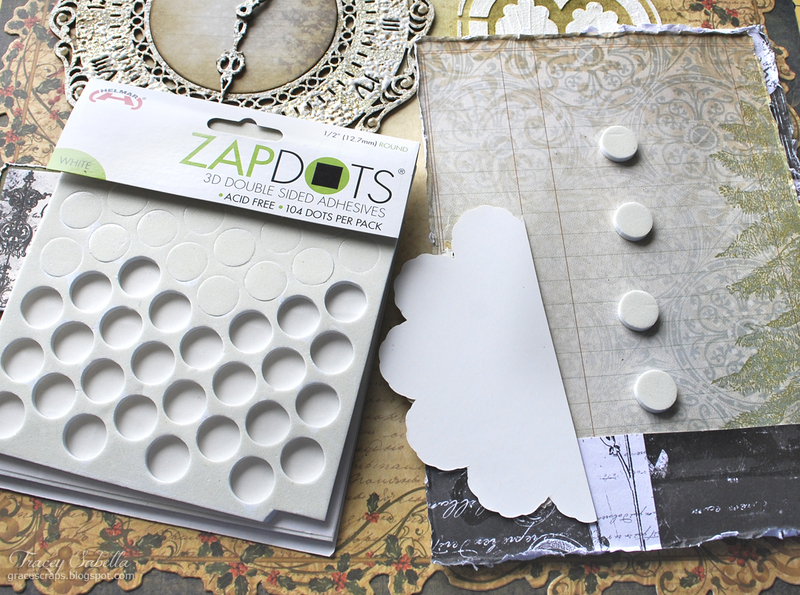 I hope you'll try some Helmar Zapdots on your projects to give added height and dimension to your next scrapbook layout or card. Hi Helmar fans! Christine up on the blog with you today! I love using my paper crafting supplies to make new home decor. It's personalized to be one of a kind and often times thrifty and quick to do! Plus then when I get tired of looking at it, I can easily switch it out for a new project. Another important element to mention is that I have four kids....so usually the quick part is pretty important. And that is where Helmar's Craft Glue comes in to play. or because I have little hands nearby - I can always count on it being dry in little to no time! and can be perfect for decor celebrating Patriotic holidays or as I did in my case hanging up in a bedroom for a little boy. I cut out stars using my cameo and then laid them out with string and craft glue. I used an embroidery hoop covered with wash tape for the top of my mobile. I thent tied on the strings of stars until I was satisfied with the fullness of it. I hung it up in my son's room and he absolutely loves gazing at it! Hi , its Ava here today to share a very significant date with all of you. November 11 was chosen as the official date for Veterans Day in reference to the ending of World War I. Families with members who have served in the military appreciate a day of remembrance that can be share with all of us. We must always remember and demonstrate to the young the gratitude we have for those that have served in the military. Leading to my completed cards, I have gathered my supplies of Helmar Decoupage & Craft Paste and Clearsnap Ink along with my stamps. The Helmar Zap Dots foam worked well with this project. Applying the Helmar Decoupage paste gave the first layer of my flower a great attachment to my card which had already had a layer of modelling paste and gesso. Helmar Decoupage paste was also a great paste to adhere the seed beeds to the center of the flowers. I love the red jewel tone of the mulberry paper. This side view of the card, shows how well the Helmar Decoupage paste dries clear and crisp to match the additional petals of the poppy. The black colored Helmar Zapdots blend well with this project. The second card showcases the small poppies and both cards have words from ScrapMatts chipboard that have been inked with Clearsnap. Please remember your Veterans on November 11th. DIY Fascinator for last minute Melbourne Cup Luncheon! With Melbourne Cup just around the corner the ‘Fascinator’ has once again come to our attention and with Catherine, Duchess of Cambridge having a vast collection herself, they are probably the headpiece of choice at this year's Cup. Inevitably there is alway that last minute invitation the day before the Cup to ‘come on over and we’ll make an afternoon of it’ .. ‘oh, and be sure to wear a hat’!!! Yes, it does happen and it happens quite regularly!! Well we don’t all have a closet full of posh hats or fascinators to choose from so here’s a simple solution for any crafter. Gather yourself up some supplies, felt, fabric feathers, lace, beads, buttons, ribbons and anything else you can think of that may complement your outfit of choice together with your favourite Helmar glues. 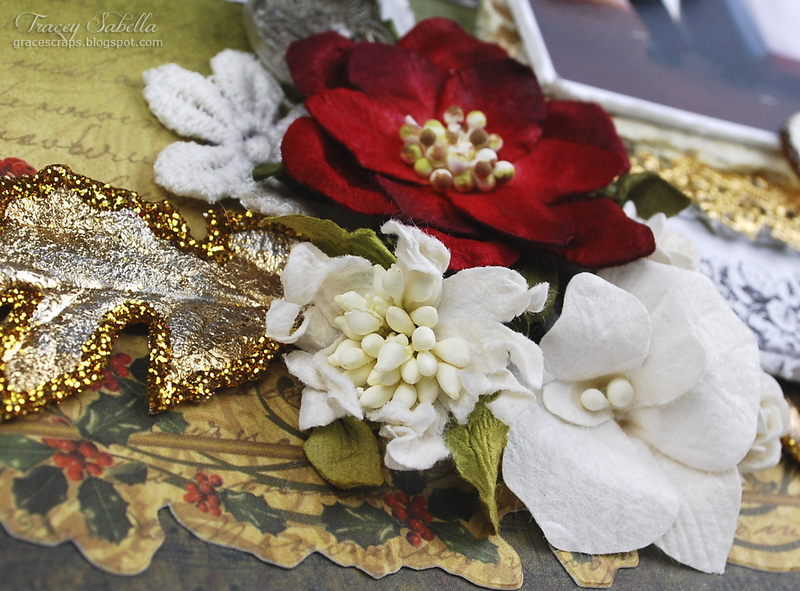 Cut a circle of felt or thick fabric and glue a flower to it using Helmar Quick Dry Adhesive. I made a lace flower by gathering up a strip of lace with a running stitch and joining at both ends. Then layer some tulle or more lace and build your fascinator as you would an embellishment on a scrapbooking page, layer upon layer. Slide a couple of feathers in and loop some ribbon and before you know it your wonderful work of art will be ready. A little bit of bling never goes astray so using my Helmar’s Gemstone Glue I fixed some lovely crystals to the centre of the flower, just enough so the light would catch them. Lastly turn the fascinator over and stitch a hair comb to the underside or you can also glue your piece to a headband using Helmar’s 450 Quick Dry Adhesive for extra strength. And there you have it, a quick and simple fashion statement for your Melbourne Cup Luncheon and if your fascinator is not too large, you can also remove it from the clip at the end of the day to use as an embellishment on any future layouts to remember this wonderful day!